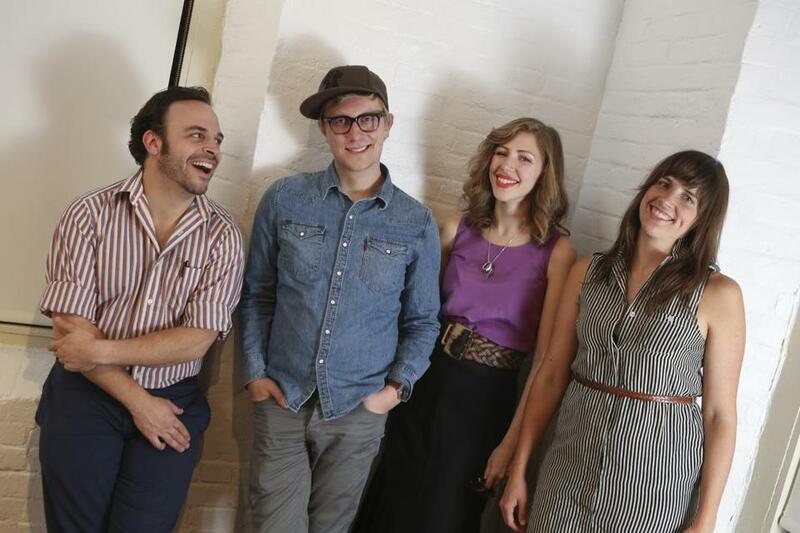 Having met as New England Conservatory undergrads, (from left) Mike Calabrese, Mike Olson, Rachael Price, and Bridget Kearney formed Lake Street Dive. Feb. 18, and will then play a sold-out show at the Sinclair in Cambridge on Feb. 21. This all follows the group’s TV debut this month on “The Colbert Report” and, back in September, a critically lauded performance in the “Another Day, Another Time” concert at The Town Hall in New York to promote the Coen Brothers’ new film, “Inside Llewyn Davis.” A film of the concert is now playing on the Showtime cable network. But the biggest spur to the 10-year-old band’s current surge — including all of the above and more sold-out shows that extend into the next three months, with another in Boston, at Royale, on April 6 — has been a YouTube video of Lake Street Dive’s on-the-street performance of the Jackson 5’s “I Want You Back.” The clip has gone viral, with more than 1.4 million views. Like every “overnight success,” this one has been slow in coming. They convened as undergraduates at New England Conservatory in spring 2004, knowing they wanted to make music together but not quite sure what that should be. Earnest jazz students wanting to push the envelope, they considered combining country music and free improvisation. Eventually, traveling on the road together, they gravitated toward the music of artists they all enjoyed listening to — Stevie Wonder, Paul Simon, Bob Dylan. Perhaps this accounts for their singular blend of Motown, British Invasion, and other strands of pop, jazz, and R&B. Boston jazz fans have been aware of Price’s singing for a while. She’s recorded with a trio, and at clubs like Scullers you could always sense the ease with which she tore through standards, her eagerness to accelerate into the curve of the next tricky harmony or lyric. Critic’s picks for pop music performances this week. Then came “I Want You Back.” Originally posted in spring 2012 as a promotional video for the band’s six-song covers EP “Fun Machine,” the clip was getting respectable if not outrageous traffic. But in October, while the band was in the studio recording “Bad Self Portraits,” “some nameless, faceless champion of the band,” as Kearney says, posted the video on Reddit. Literally overnight it scored hundreds of thousands of views. The video led to gigs. On “Bad Self Portraits” you could say the Lake Street Dive’s songs and sound are the same, only bigger. There’s more guitar (thanks to Olson’s late adoption of the instrument), piano, and some overdubbed horns. And the group vocals in particular pop, with a diverse range of perfectly deployed “Woo-ooh!’’s. “I remember on our first albums, thinking why don’t these background vocals sound good?” says Kearney. “After some time, I realized it was that we weren’t singing them well.” The band buckled down, working on dynamics and articulation. They also benefited from the coaching of “Bad Self Portraits” producer Sam Kassirer (“our first full-on producer,” says Kearney). For his part, Kassirer says the band surprised him with its range of reference — everything from the expected jazz and soul to Beck and the Beatles. As an example he points to “Rental Love,” the Beatles-esque ballad from the new album, which includes two piano tracks and two drum tracks. For now, the band is working it. A couple of nights after Colbert, they play the sold-out Narrows Center for the Arts in Fall River. They come out with all four voices blasting a five-note “ah-ah-ah-ah-ah!,” setting up Price’s tear through the opening verse of Calabrese’s girl-group-style “Stop Your Crying.” Throughout the set, the Motown influence is evident. At times the band sounds like a soul revue, with its own built-in backing chorus. And there again is that knack for the offbeat cover arrangement, in this case George Michael’s “Faith,” set to a New Orleans second-line groove.